Back in July I proposed the Open Shelves Classification (OSC), a new, free, crowdsourced replacement for the Dewey Decimal System. I also created a group to start in on the project. 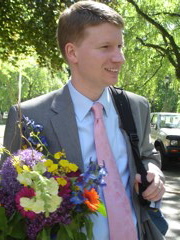 The proposal included a call for a volunteer to lead the group. I was happy to write the software, and members would create the OSC, but someone with a library degree was needed to shepherd the project and make the occasional tough decision. I’ve found two: the LIS team of Laena McCarthy and David Conners. It turns out, I already knew them. Abby and I met with Laena and David, back at ALA 2007, when they were MLS students doing a joint LibraryThing-related project called Folksonomies in Action. They impressed us then. It was extraordinary to talk to librarians with a deep understanding and creative take on the ideas LibraryThing was exploring. Since then Laena and David have started promising careers as librarians and professors. So, after receiving word they were interested in the project, we are only too happy to bring them on. Laena’s teaching and research focus on the application of bottom-up, usability-centric design and collaboration. 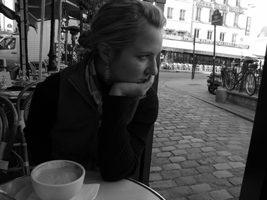 She is currently researching image tagging, FRBR for works of art & architecture, and information architecture. Her work has been published in Library Journal and the forthcoming Magazines for Libraries 2008. In her free time, among other things, she can be found making jam, competing in food competitions, scuba diving and writing. David’s research interests include subject analysis, FRBR, and, occasionally, doped ablators. His work has been published in Library Journal, The Serials Librarian, and Physics of Plasmas. The torch is passed! From this point on, it’s their project to direct. But we’re in agreement on their role: They aren’t royalty, they’re facilitators. They’re there to listen and to encourage conversation. They’re there to guide things toward consensus. They’re there too see the project stays on track and true to its goals. They’re there to propose forking the project or moving it elsewhere, if that’s what it needs and the community wants it. Laena and David are doing this for fun and interest. As a fun side-project with no financial component—OSC is by definition public domain in every respect—we can’t pay them. But we’ve promised to help pay their way to LIS conferences, if someone wants them to talk about it. (At least one group already does.) And there’s the hope that, if OSC can accomplish its goals, they will have helped create something highly beneficial for libraries and library patrons everywhere. If you’re interested in the project, come join the group and find out more. This mural is said to depict Dewey and the railroad service he gave to Lake Placid, FL. It’s time to throw Dewey under the train. I hereby invite you to help build the Open Shelves Classification (OSC), a free, “humble,” modern, open-source, crowd-sourced replacement for the Dewey Decimal System. I’ve been speaking of doing something like this for a while, but I think it’s finally going to become a reality. LibraryThing members are into it and after my ALA panel talk, a number of catalogers expressed interest too. Best of all, one library director has signed on as eager to implement the system, when it comes available. Hey, one’s a start! The Call. I am looking for one-to-five librarians willing to take leadership on the project. LibraryThing is willing to write the (fairly minimal) code necessary, but not to lead it. As leaders, you will be “in charge” of the project only as a facilitator and executor of a consensus. Like Wikipedia’s Jimmy Wales, your influence will depend on listening to others and exercising minimal direct power. For a smart, newly-minted librarian, this could be a big opportunity. You won’t be paid anything, but, hey, there’s probably a paper or two in it, right? Why it’s necessary. The Dewey Decimal System® was great for its time, but it’s outlived that. Libraries today should not be constrained by the mental models of the 1870s, doomed to tinker with an increasingly irrelevant system. Nor should they be forced into a proprietary system—copyrighted, trademarked and licensed by a single entity—expensive to adopt and encumbered by restrictions on publishing detailed schedules or coordinating necessary changes. In recent years, a number of efforts have been made to discard Dewey in favor of other systems, such as BISAC, the “bookstore system.” But none have proved good enough for widespread adoption, and license issues remain. Free. Free both to use and to change, with all schedules and assignments in the public domain and easily accessible in bulk format. Nothing other than common consent will keep the project at LibraryThing. Indeed, success may well entail it leaving the site entirely. Modern. The OSC should map to current mental models–knowing these will eventually change, but learning from the ways other systems have and haven’t grown, and hoping to remain useful for some decades, at least. Humble. No system–and least of all a one-dimensional shelf order–can get at “reality.” The goal should be to create a something limited and humble–a “pretty good” system, a “mostly obvious” system, even a “better than the rest” system–that allows library patrons to browse a collection physically and with enjoyment. Public-library focus. LibraryThing members are not predominantly academics, and academic collections, being larger, are less likely to change to a new system. Also, academic collections mostly use the Library of Congress System, which is already in the public domain. Statistical testing. To my knowledge, no classification system has ever been tested statistically as it was built. Yet there are various interesting ways of doing just that. For example, it would be good to see how a proposed shelf-order matches up against other systems, like DDC, LCC, LCSH and tagging. If a statistical cluster in one of these systems ends up dispersed in OSC, why? I have started a LibraryThing Group, “Build the Open Shelves Classication.” Members are invited to join, and to start working through the basic decisions. Of course, my mind went to OCLC, the Dublin, Ohio-based global library-data organization. OCLC’s core business involves maintaining a central database of cataloging records, largely created by others, which member libraries pay to access. That OCLC was a great invention can hardly be denied. Personally, I think it has become a relic and an danger to the future of libraries. Agree with me on this or not, there’s no question it is highly profitable—driving a steady stream of acquisitions—and in its fee structure calls into question the core idea of the non-profit. So, why hasn’t someone take away OCLC’s non-profit status? It seems the Ohio legislature passed some sort of private bill removing Ohio organizations involved in “library technology development” (and starting with the letter “O”?) from the court’s requirements. Well, I guess that’ll do it. UPDATE: I’m working up a presentation on why OCLC’s (also unfree) Dewey Decimal System needs to be killed-off, and what distributed, open classification could replace it. I’m all ears for anti-Dewey examples. And if any bright young cataloger with no love of Dewey wants to talk to me about heading up the effort, I’d love to hear from you. *$35 billion, doing a quick check against Wikipedia. Of course, GDP is wiggly as heck.